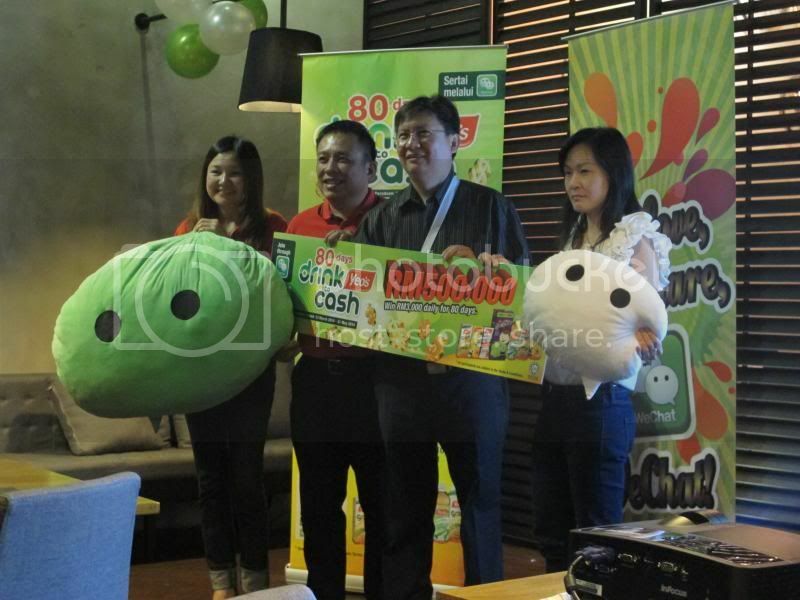 Yeo's Malaysia launched a contest called Yeo's 80 Days Drink To Cash Contest on 12th March 2014 at D'Cuisine, Jaya 33 with WeChat announcing their partnership with Yeo's as a platform to announce their latest news, updates and offers. 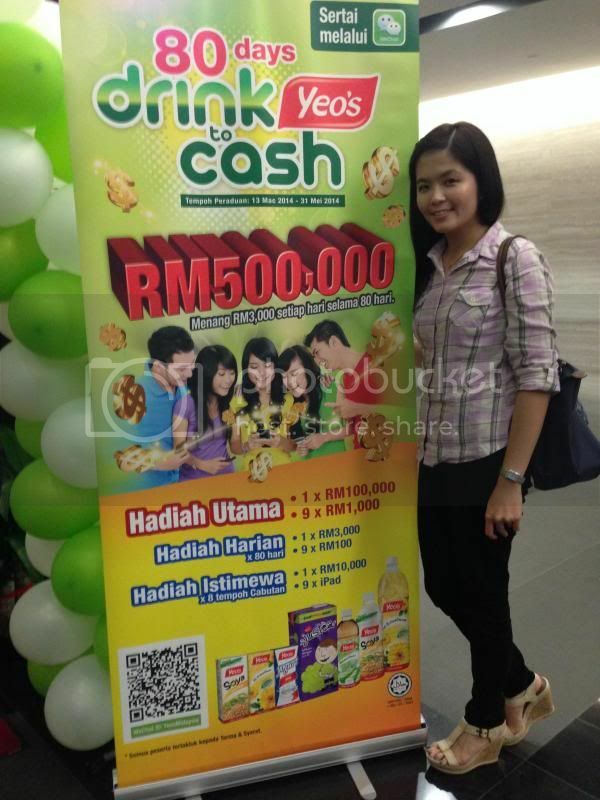 The consumers stand a chance to win cash prizes of RM500 000 and 72 iPads upon their purchase of Yeo's products. 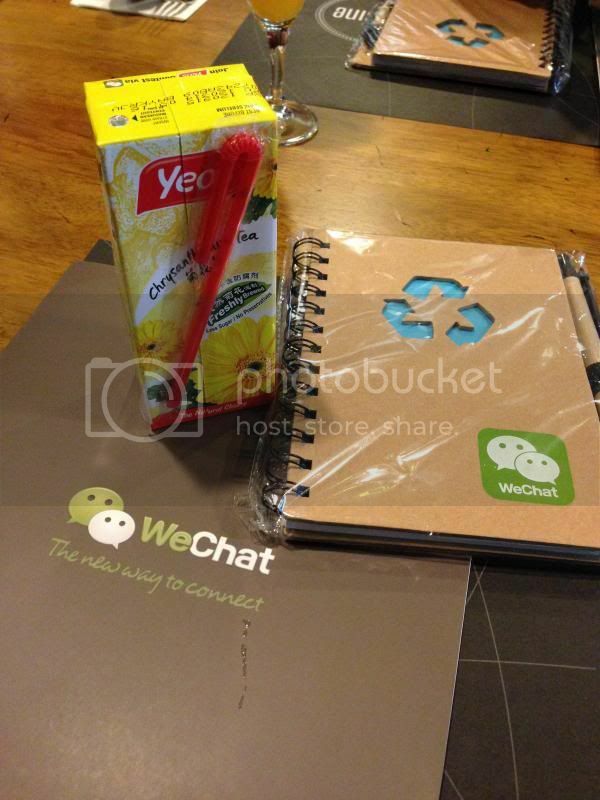 The team at Yeo's Malaysia understands the importance of digitalization and social media platforms in this new age where most Malaysians are smartphone users. 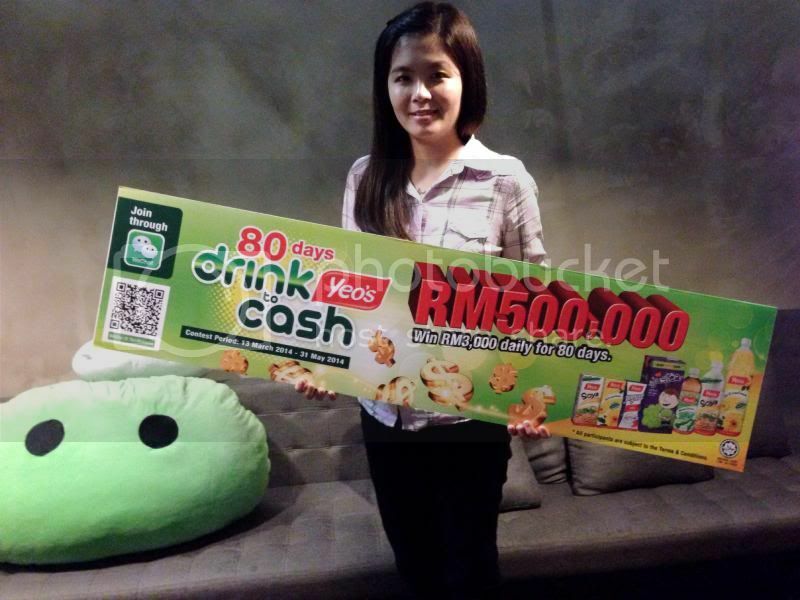 With WeChat, it's so easy to participate in the Yeo's 80 Days Drink to Cash Contest. 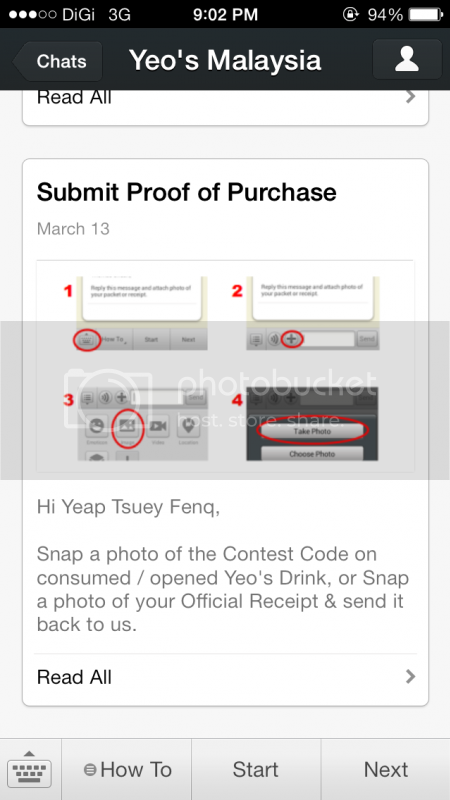 Consumers just need to subscribe to WeChat's Yeo's Malaysia Official Account and follow the simple steps to participate in the contest. Results will be announced daily via WeChat and best of all, there is no SMS or postage charges for consumer to send in their entries. 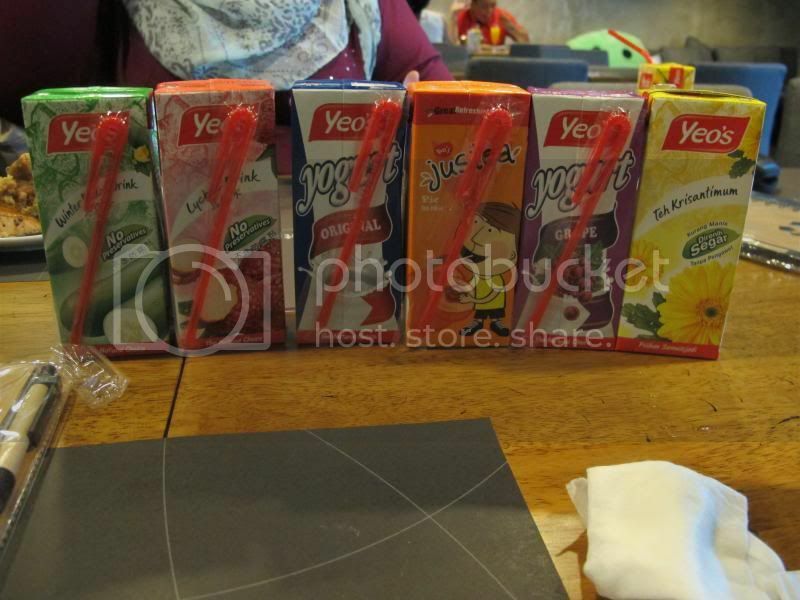 From 13 March to 31st May 2014, users who purchase any Yeo's, Justea or SoyRich beverage in Tetra Pak 250ml, Tetra Pak 1L, PET Bottle 350ml, PET Bottle 500ml or PET Bottle 1.5L will be eligible to participate in the contest. 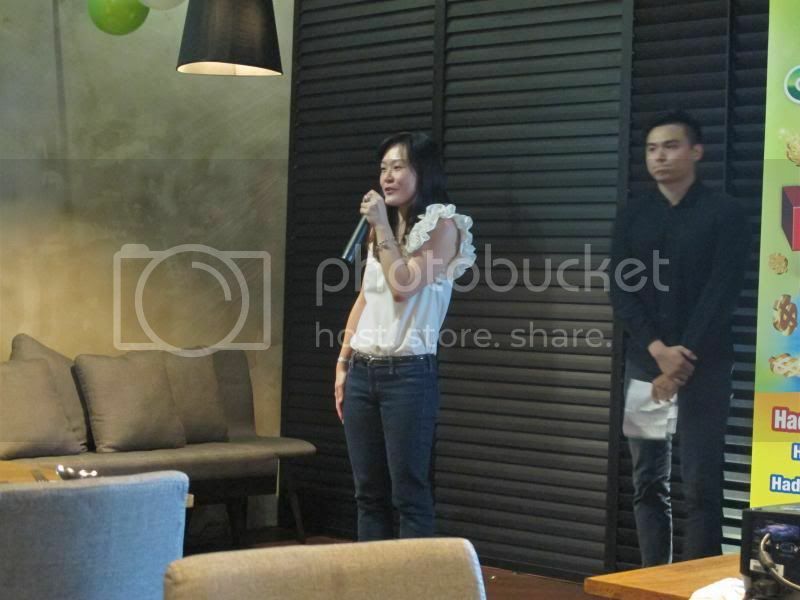 Miss Leong, Business Development Manager of WeChat Malaysia gave her speech. 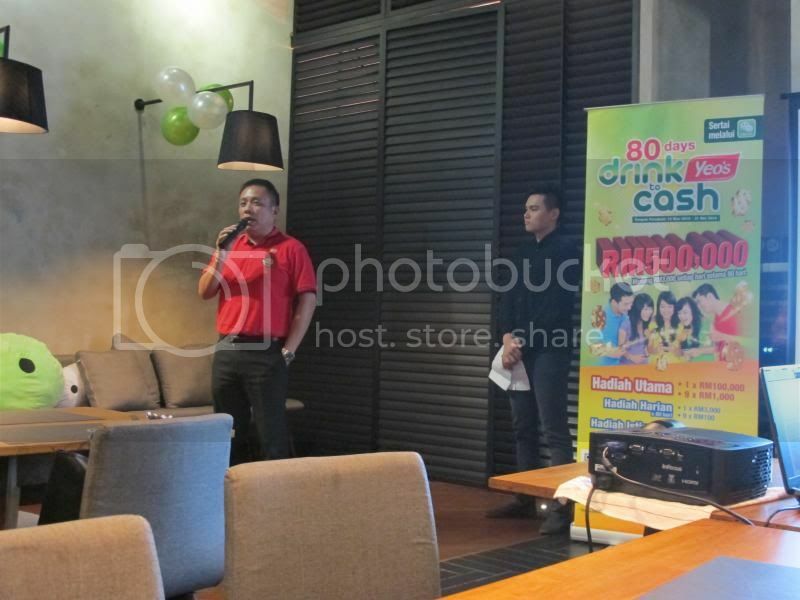 Mr Vincent Chui, General Manager of Yeo's. 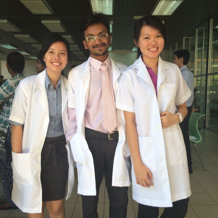 Group photo was taken to officiate the launch. 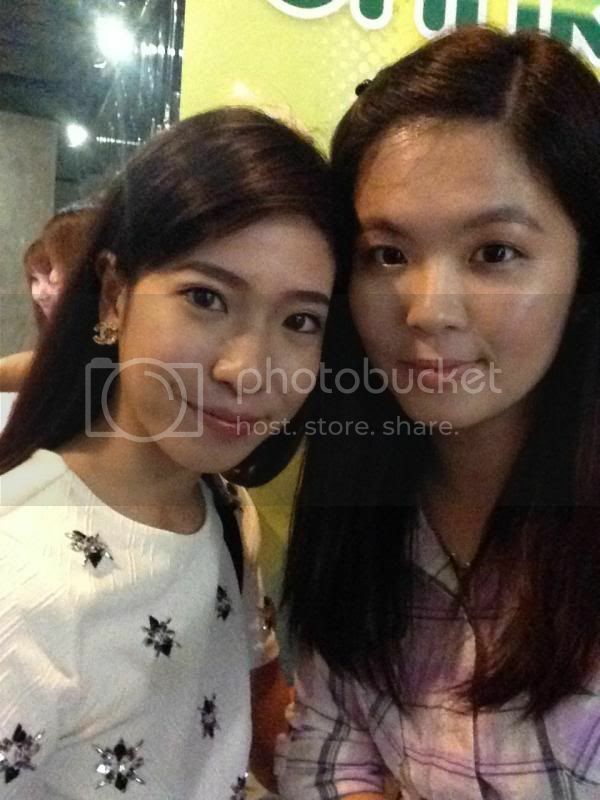 With Isabella, one of the famous blogger in Malaysia. She is so pretty! 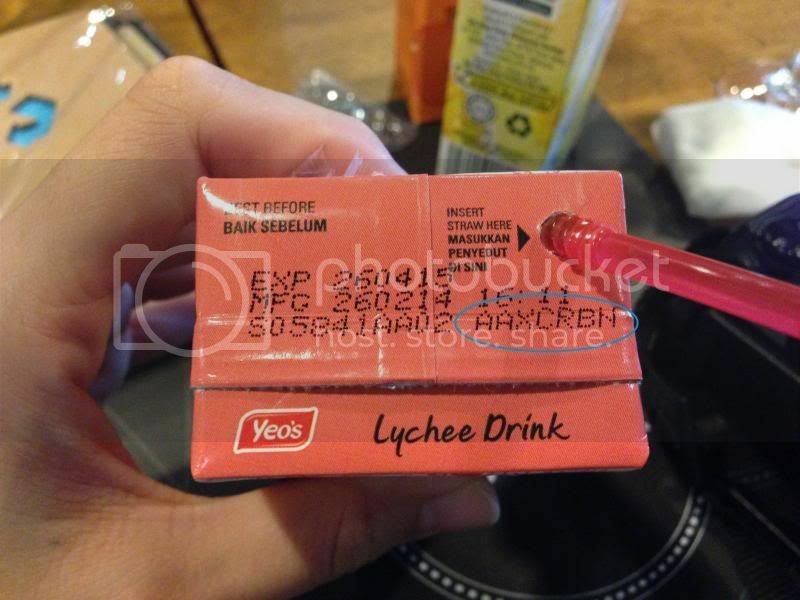 Buy any Yeo's, Justea or SoyRich beverage in Tetra Pak 250ml, Tetra Pak 1L, PET Bottle 350ml, PET Bottle 500ml or PET Bottle 1.5L ("Yeo's Products") with codes on pack ("Contest Code"). 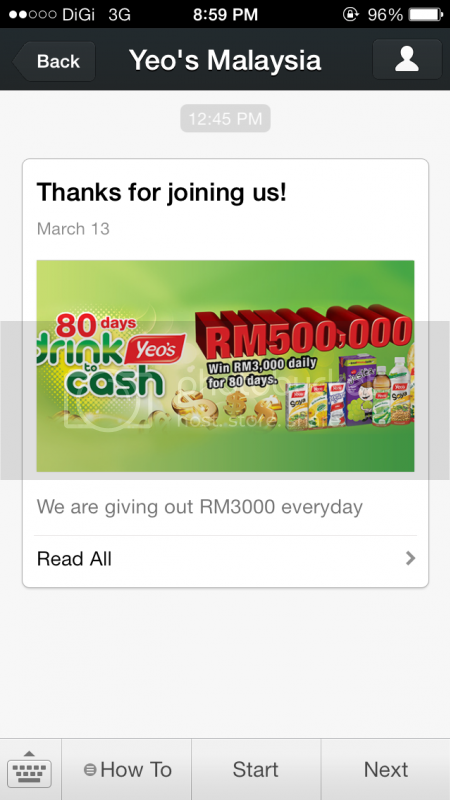 Register yourself at the Yeo's Malaysia WeChat Official Account tab in order to be eligible for the contest. Contest Code which is circled in blue and a straw must inserted into the tetra pak in order to eligible for the contest. 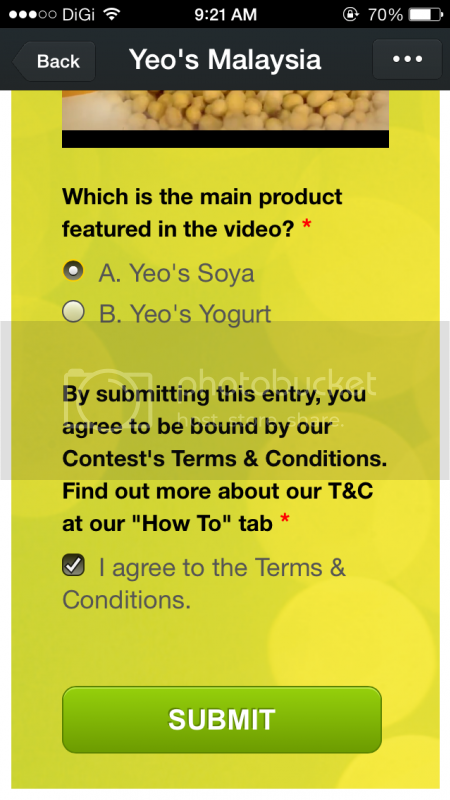 Upon successful submission, eligible contestant will receive an official notification from Yeo's Malaysia WeChat with a hyperlink to view Yeo's Commercial via YouTube. 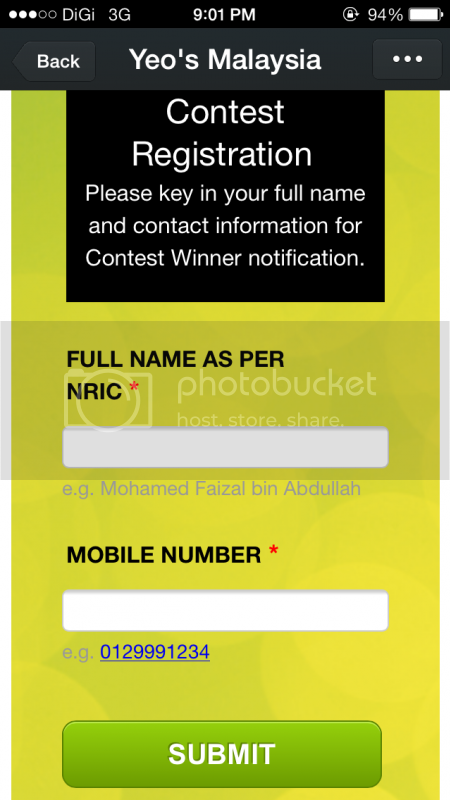 Any data charges by the respective mobile operator will be borne by the eligible contestant. 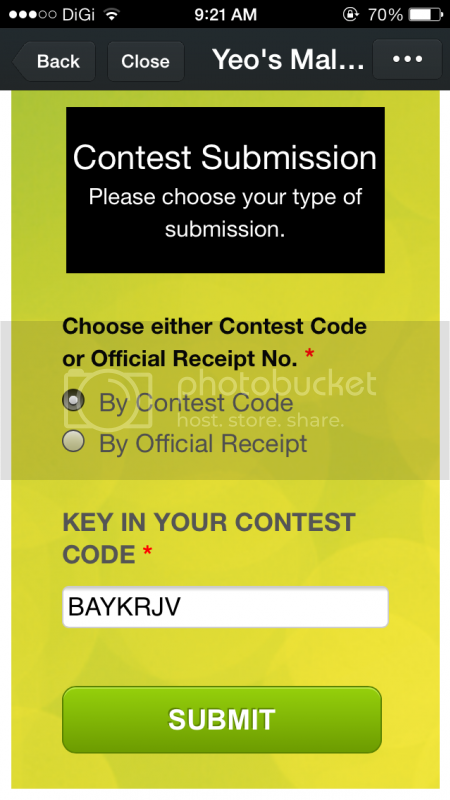 Enter the contest code at the space given and you can click submit to proceed to the final step. 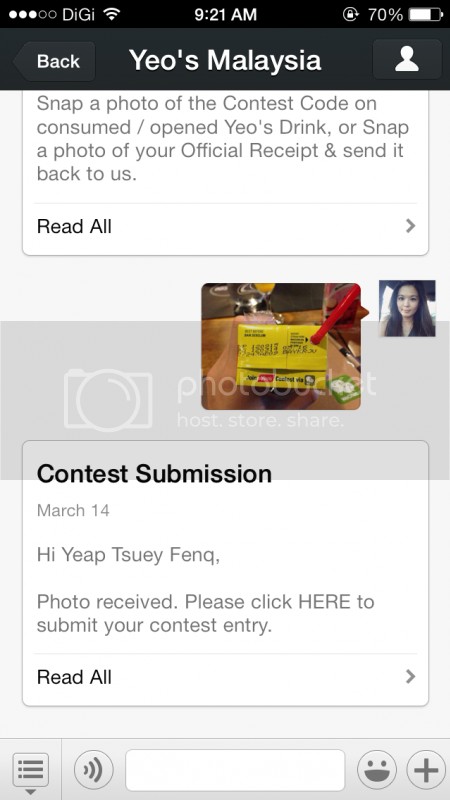 You will be led to this page which means that your submission for the contest has already been received.